Students wishing to make use of the Maker Hub must first attend a brief introductory session to familiarize themselves with the basic safety rules of the space, and sign our Release Waiver. Some pieces of equipment also require their own safety orientation session before students can use them. Orientation sessions can be delivered any time during our open hours. Classes, clubs, or other school groups are encouraged to contact us to schedule an orientation session or a tour. See our Policies and Procedures page for more details. We learn best when we learn together! Depending on availability of experienced leaders, we sometimes run Weekly Skill Shares on topics of interest to our community. In the past we've held weekly sessions on Book Binding, 3D Printing, and Electronics. Weekly Skill Shares are less structured than a workshop, and more of a way for people with similar interests to get together to help each other with their projects and exchange ideas. Keep an eye on the Public Events Calendar for Weekly Skill Shares, or contact makerhub@georgetown.edu to set up your own. Do you have a skill you want to share? Please contact us at makerhub@georgetown.edu if you'd like to set up your own weekly skillshare or one-time workshop! Introductory workshops are optional, but recommended for first-time users. Though workshops tend to fill up, please remember that you're always welcome to drop by the Maker Hub during our open hours to learn from our talented staff and volunteer community. Take a look at our Skills Calendar to see what skills available to be taught during our open hours. This is the Maker Hub Public Events Calendar, where we share upcoming workshops, presentations, open club meetings, weekly skill shares, and other activities open to the public. We will also display our open hours and those rare occasions when the Maker Hub is closed to everyone. You are welcome to use the Maker Hub to share a skill or show off a project. If you'd like to host an event or run a workshop in the Maker Hub, please contact makerhub@georgetown.edu to make arrangements. Please bear in mind that the Maker Hub cannot be reserved for private events, though the adjacent Idea Lab can be reserved. Repeats every week every Friday 12 times except Fri Mar 08 2019, Fri Apr 19 2019. 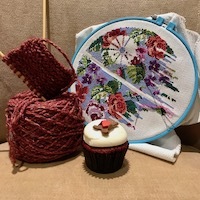 Hoyarn is a Georgetown University knitting and crafting club open to anyone who would like a safe and creative space to practice their craft. We meet weekly in the Maker Hub as a group, and also offer knitting and crochet workshops through the Hub.